Food and beverage trends leave lasting marks on production best practices, but one recent development could very well transform operational standards across the food and beverage space. In recent years, consumers worldwide have embraced free-from foods, which omit certain ingredients, additives, or contaminants, such as gluten, antibiotics, or pesticides, Bloomberg reported. Analysts at Euromonitor predict that free-from food sales in the U.S. will grow 15 percent between 2017 and 2022, creating $1.4 billion in revenue. Businesses in the food and beverage space certainly stand to benefit from this trend, but many have found that free-from food production requires significant changes to their shop floors. Even so, it appears this phenomenon is here to stay, meaning these companies must embrace free-from foods production or risk losing their footing in the marketplace. The free-from food movement began in the late 2000s and early 2010s, as consumers embraced wholesome eating habits at the behest of public health officials and popular fitness and nutrition experts. Sales of packaged foods dropped significantly during this period, while interest in organic products soared. At the same time, food allergy awareness increased drastically, leading people of all ages to scour their diets for problematic ingredients. By 2014, approximately 60 percent of Americans attested to eating larger quantities of fresh fruits and vegetables, while 46 percent said they were avoiding processed items containing artificial colors and flavors, according to researchers from Nielsen. By 2015, 51 percent of U.S. residents reported having an understanding of common food allergens, according to survey data from the American College of Allergy, Asthma and Immunology. Dairy, gluten, antibiotics, pesticides and other once-standard-issue additives became anathema to large numbers of consumers, forcing businesses in the food and beverage industry to rethink their processes and expand their product lines. Major companies in the food and beverage space have transformed their production workflows to meet the expectations of free-from advocates. According to Bloomberg, General Mills recently put the finishing touches on an eight-story structure that sorts through oats destined to become Cheerios and remove any traces of gluten. It took five years to construct the facility, which can process 1 billion pounds of oats per year. Although Cheerios do not contain gluten, General Mills built the behemoth sorter anyway, ostensibly to ensure gluten particles from other farms near its oat-harvesting operations would not make their way into finished product. General Mills is likely to benefit from this move; almost one-quarter of U.S. consumers consider gluten-free alternatives necessary, Nielsen discovered. In 2018 alone, these individuals are expected to spend more than $4.4 billion on such products, according to MarketsandMarkets. Poultry producer Butterball took similar steps back in 2017, rolling out an entire line of antibiotic-free turkey products, all of which are produced at a state-of-the-art facility in Mount Olive, North Carolina. Here, production teams carefully handle antibiotic-free poultry to ensure it does not come into contact with conventional items. While this has certainly complicated shop floor operations, the company’s embrace of antibiotic-free production and packaging methods has certainly paid off. Sales of Butterball antibiotic-free ground turkey saw a year-over-year increase of 71 percent in the third quarter of 2018, as free-from food devotees flocked to the new offerings, according to Bloomberg. However, the steps these and other food and beverage producers have taken are not meant to meet the needs of consumers in a niche market. Free-from foods could become the norm. While not all eaters identify with this movement, a majority are embracing healthier eating habits and therefore becoming more discerning about their food choices, habits that might translate into an across-the-board embrace of items now associated with the free-from foods phenomenon. 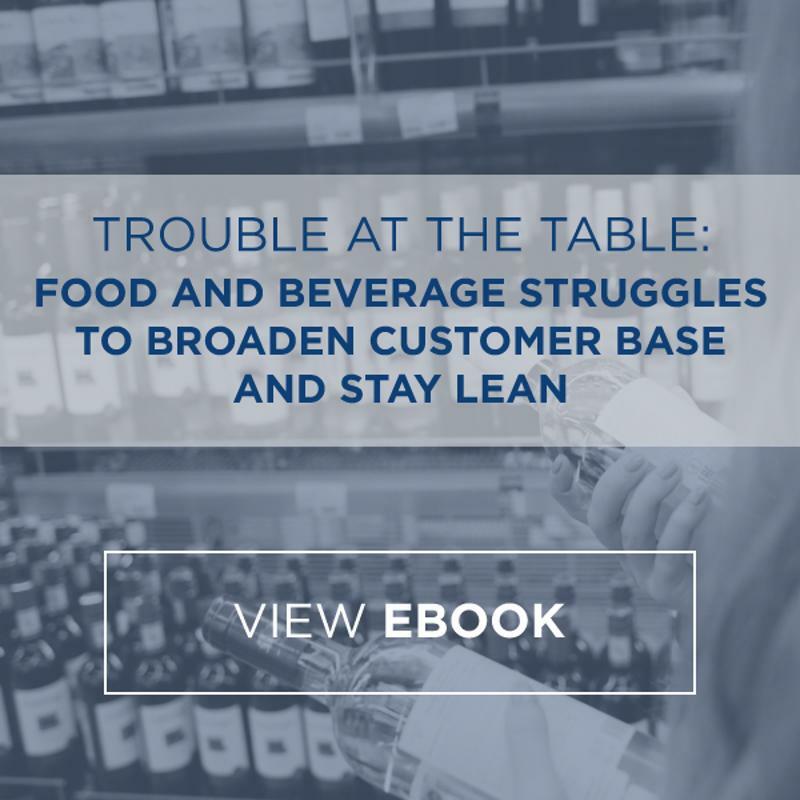 Food and beverage producers that have yet to develop products catering to the growing slice of free-from consumers would be wise to take action quickly or risk surrendering serious ground in the marketplace. Process evaluation and improvement are, of course, critical to managing change of this kind, especially around raw material acquisition, an essential variable in the creation of shop floor processes capable of producing free-from food products at scale. But production changes constitute only half the equation. Not only do consumers want food and beverage makers to provide free-from products, they also demand that companies outfit such offerings with labels featuring complete ingredient lists for total transparency, according to Food Processing. In the end, firms that take these steps can effectively prepare for the future of food and beverage production and find success in the years to come. Here at USCCG, we’ve been working with businesses across numerous industries for more than 50 years, including the food and beverage industry, helping them as they adapt to marketplace transformations of all kinds. Connect with us today to learn more about our work.